The president's endorsement of Ron DeSantis proved fatal to Putnam, whose political career is derailed at age 44. LAKELAND — As it was envisioned decades ago, Tuesday night was supposed to be the next step in the ascension of Bartow favorite son Adam Putnam. Instead, one of the brightest stars in Florida's Republican Party lost the GOP primary for governor to Ron DeSantis, a relatively unknown three-term congressman until a few months ago. At the Terrace Hotel in downtown Lakeland, the shock wasn't the result, but how quickly the race was called — just minutes after all the polls closed in the entire state. In defeat, his supporters — some of which have voted for Putnam since he ran for the Florida House 22 years ago — blamed one person: President Donald Trump. "I cannot remember any time I've ever been so upset with a Republican president," said Jeff Griggs, a Lakeland resident who described himself as a lifelong Republican. "It was totally uncalled for. He's going to get himself impeached if he keeps this up." In his concession speech, Putnam didn't mention Trump. But his supporters quickly pointed to the president's intrusion into party politics as a deathblow to Putnam. Rep. Jim Boyd, a Republican representing Manatee County and a Putnam supporter, said he wish Trump hadn't "put his thumb on scale" in a primary. "It's the wrong message when we got bigger fish to fry," Boyd said, meaning keeping Republicans in control Congress. Lakeland banker Robert King said he'll get behind DeSantis in November, but couldn't help shake his head at Trump on Tuesday. "I don't understand why the president involved himself in a primary," King said. "There's absolutely no reason to do that." Others weren't ready to come together as a party yet. Keith Rupp, a Republican strategist, said he is leaving the GOP after Tuesday's results. "I've been a lifelong Republican and I've worked for three different members of Congress," Rupp said. "I can't believe the party has turned into a cult of personalities." Trump's microphone proved more effective than Putnam's better-funded campaign. Through Aug. 10, Putnam had raised $38.8 million to DeSantis' $17.6 million, and has used it to outspend DeSantis in television ads $21.9 million to $10.5 million, according to campaign finance reports. Putnam also had a much bigger ground game, which he alluded to in his concession speech. "We ran an honest to goodness genuine campaign and I really am proud of it," he said. For Putnam, Tuesday's loss derails his political career at the age of 44 — one that seemed destined to end in the Governor's Mansion or higher. "A lot of them think he'll be governor in the next 10 to 15 years," Bill Boe, then vice chairman of the Alachua County Republican Executive Committee, told the Lakeland Ledger after Putnam won his first election in 1996. Putnam planned for that moment even as a child, his grandfather, pioneering citrus farmer Dudley Putnam, once said. In 2000, Putnam was elected to represent Polk County and central Florida in the U.S. House of Representatives. He gained national notoriety overnight for his age (at the time, he was the youngest member of Congress), accentuated by his mop of hair (President George W. Bush nicknamed him "Red") and aw-shucks mannerisms. This new wave of Republicans in Congress would include DeSantis in 2012, and would eventually pave the path for Trump's shocking ascension to the White House in 2016. By 2017, the Governor's Mansion was calling and Putnam announced his candidacy on a sweltering day in Bartow last May. He immediately amassed a sizable war chest and healthy lead in the polls. Later, he convinced a top potential rival, House Speaker Richard Corcoran, not to run. Corcoran instead endorsed Putnam. Even before Trump interjected himself into the race, Putnam's campaign stumbled. He declared himself a "proud NRA sellout" on Twitter just months before 17 people died in a mass shooting at a Parkland high school. Student survivors-turned-activists would later stage protests at Publix for supporting Putnam's campaign. 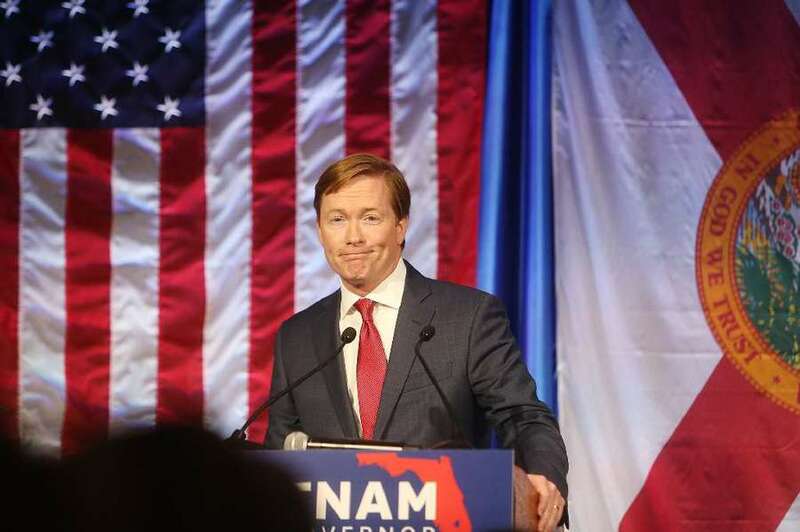 Questions arose about Putnam's management of the state's concealed weapons program after the Tampa Bay Times reported that the Department of Agriculture failed to review the results of a background check during a record surge in applications for concealed carry licenses. His office had to revoke permits from 291 people. More stories emerged on the agency's mishandling of permits under Putnam's watch. He was supposed to run on his gun record; instead it was dogging his campaign. Then came Trump's endorsement. The polls shifted in DeSantis' favor and Putnam never recovered. People who had watched Putnam's political career assuming he would one day be governor, or maybe even president, were left unsure of what's next for the Bartow native. "I've been wondering that myself," said S.L. Frisbie, a Lakeland newspaper publisher who has known Putnam since he was born. "I hope he stays in public service. Heaven knows he's young enough." Not many politicians recover from a defeat after 22 years in politics, but most aren't just 44 when it happens. More problematic may be the changing political tide that has made it increasingly difficult for career politicians to win campaigns, especially in a Republican primary. "Adam's a smart, gifted, really amazing guy," Rupp, the strategist said. "He's got a bright future ahead of him no matter what he does, politics aside."